That’s right fans of the universe and audiences of the celestial show – it was an amazing night. 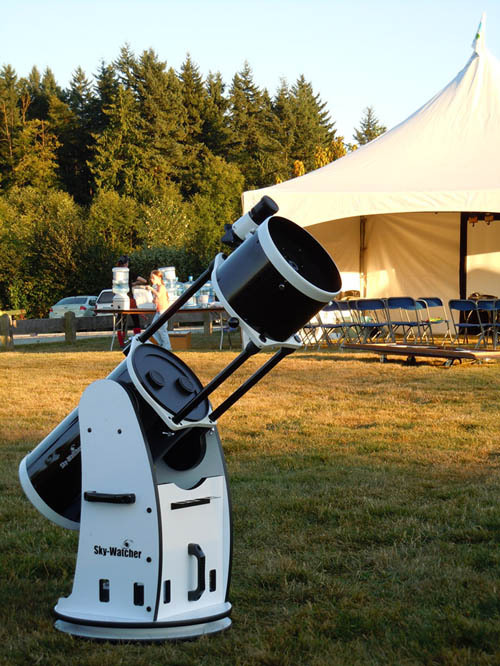 Metro Parks and Royal Astronomical Society of Canada hosted the All Night Star Gazing at Aldergrove Lake Regional Park on August 19, 2011, right here in British Columbia. Over three hundred people showed up for and gathered for an educational and family activity-packed event from dusk till dawn, of campfire stories about astronomy and constellations, Greek mythology interactive plays and more. We were pleased to prepare and provide our line up of Sky-Watcher telescopes for everyone visited... for a whole night of star gazing! Thanks to the clear sky and weather, while plenty of satellites floated across our sky and made their way across our view, we got to observe the beautiful Saturn, the donut-shaped M57 “Ring Nebula”, and even Jupiter later at night. Not only were people “solar observing” for the famous sun spots through specialized solar telescopes and equipment, we also managed to capture the the “Chained Lady” Andromeda constellation through our telescope. Some lucky audiences even got to spot several shooting stars! We are hugely thankful to Metro Parks and Royal Astronomical Society of Canada who organized the event, and everyone who visited that helped to make it possible.